The people have resorted to using canoes to move around in the community. 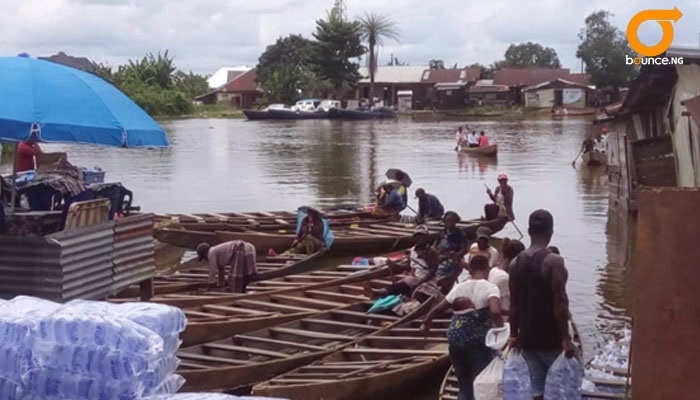 Canoe owners in Bebelebiri ll community in Bayelsa State are making money ferrying residents from one location to another, as they go about their daily activities despite the flood. Fortune has arrived overnight for canoe owners in Bebelebiri ll community in Bayelsa State while others are in lamentation, counting their losses. "One man's meat is another man's puff-puff," some people from Niger Delta will say and that is playing out in Bebelebiri ll where flood has taken over homes while owner refuse to leave. It was late in the evening, residents of the densely populated community located opposite Hospital Waterside Jetty by the Federal Medical Centre, Yenagoa was bubbling with activities despite the flood. Power had just been restored and music blasted from heavy speakers placed by a barber's shop. By the waterside, an akara (bean cake ) seller was busy attending to her numerous customers while little children build sand castle at a distance. It had rained earlier and the river which demarcated the community from Ovom, began to rise. As the water level increased, female canoe paddlers whose line of trade was to ferry passengers and their goods across the river, took turn to load their canoes. Carrying two bags of sachet water on both hands, Adumo Albert, a petty trader from Bebelebiri ll, lament about the untold hardship the rising water level had unleashed on the community. Frowning, she told Bounce News that "after transporting these bags of water to my community through the canoe. "I will still pay some boys that will carry them to my shop. "A sachet will be sold for 20 Naira, I will increase the prices of other commodities too, to enable me cover expenses made". A canoe paddler, Mrs Alaere Oyein, who is also an indigene of the community, confirmed that they experienced flood yearly but, no resident had ever packed out of a house as a result. She however expressed fear over the current water level. "Those that live at the water front usually scoop water out from their houses by this time every year. "But this year 2018, after the flood prediction by National Emergency Management Agency (NEMA), some residents are ready to run for safety," she said. According to her, some of them are scared of what life could be outside their home while others are just used to the cheap house rent and peace they enjoy there. A self contain apartment in Yenagoa costs between 70,000 to 150,000 Naira annually, depending on the location and standard while a one-room apartment with a public toilet could cost between 30,000 to 45,000 Naira annually. An elder of the community, Mr Gabriel Warekiye, stated that nothing had ever been lost to the flood. "We keep an eye on our children but that not withstanding, they know how to swim. He wished that NEMA's prediction would be wrong this time so they would not be forced to vacate their homes. "If the water rises too much, we will run across to Ovom. "There is a school where the state Government have prepared for flood victims," he said, sounding so confident of a plan B. However, despite the rising water level canoe paddlers are always on duty even during a heavy downpour, ferrying bags of rice, garri, cement, flour and other food items. The value of money in the area is, however, seen in the cost of ferrying passengers from one side to another. They charge 10 Naira per passenger and carry ten persons during each trip. A passenger who is in a hurry, can pay 100 Naira, being the fare for 10 passengers, for a trip.